Seeing as Valentine’s day is just around the corner, I can’t think of a better time to share my simple heart origami model with you. It should be rather easy to fold even if you have no paperfolding experience. Just take your time and follow the diagrams carefully. The simple heart is one of the models that will be included in my upcoming origami book, which should be available for purchase in the next few months. Please feel free to send me your comments. 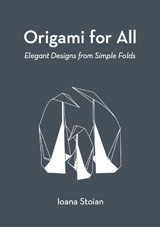 You can find out more information about the book on its website: www.origamiforall.com. P.S. – You’ll need to use a square piece of paper for this design; either normal origami paper, or trim down a sheet to make a perfect square. < Best wishes for 2013!